Jim Clark continued his stunning driving form with his third win in succession, storming to victory in the French Grand Prix at Reims. Ferrari was only able to put out one car in the race as Ludovico Scarfiotti, the replacement driver for the injured Willy Mairesse, was badly hurt in a crash in practice. In torrential rain, his car hit a wet patch of road, shot off on to the grass, hit two telegraph poles and came to rest in a ditch. He was taken to hospital suffering from leg, arm and face injuries, as well as severe shock. Another notable absentee was Count Carel Godin de Beaufort, one of the last genuine amateur drivers. The good-humoured and popular Dutchman was barred by race organisers from entering his bright orange four-cylinder Porsche, as they only wanted modern cars with six or eight-cylinder engines. Two of the British teams offered him cars to drive, but the 6ft 8in Count who weighed 15 stone, was unable to fit in the small British cars. Only five days previously, the other grand prix drivers had awarded de Beaufort a silver cup for being the best private entrant in Formula One racing. Clark took his usual position on pole and roared away to take the lead, while Richie Ginther gave fruitless chase in the second BRM until a stone pierced the radiator and he was out. Graham Hill had qualified second in the spare car after his main BRM broke down, but it stalled on the grid and he had to be push-started by his mechanics. This earned him a one-minute penalty and the subsequent loss of any championship points gained in the race. With Ginther's retirement, Jack Brabham assumed second place, and began to close on Clark when the Lotus 25's engine started to misfire. But then Brabham suffered a loose electrical lead that had to be fixed in the pits, leaving Clark to take another flag to flag victory. 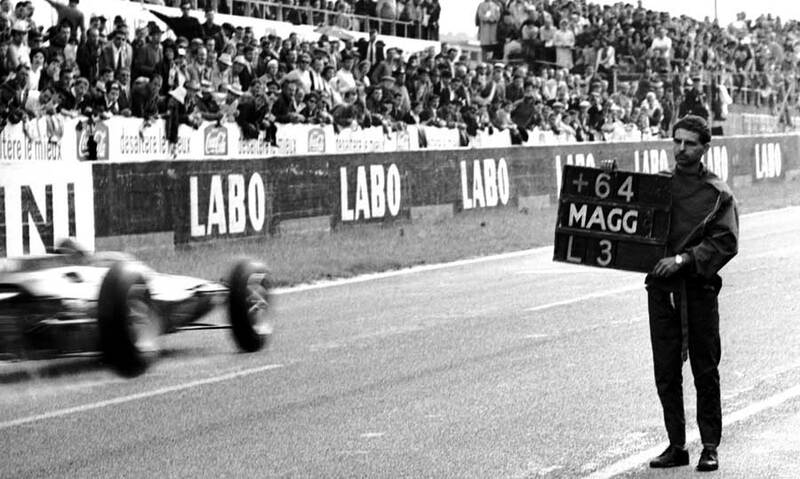 Tony Maggs finished runner up for the second year running at Reims, ahead of Hill, who wasn't awarded any points but kept the place. This meant that Clark was now 14 points ahead of Hill in the championship.